Regally Pink Choker Discounts Apply ! 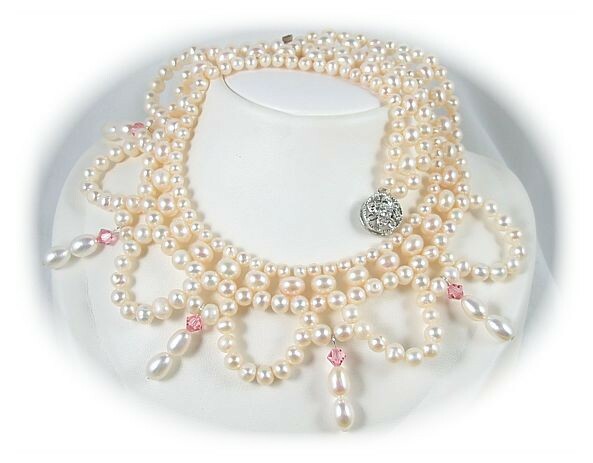 This classic design echoes the fabulous pearl collars favoured by the Victorians. Sits at the base of the neck, framing the face. Features a two row Freshwater Pearl collar with Freshwater Pearl swags and between the swags, in a flash of sheer brilliance, small pink Swarovski crystals contrast with freshwater pearl drops. Size: 38cm (15").